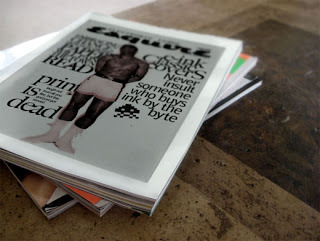 This year marks the 75th anniversary of Esquire magazine. Wonder if they're doing something special? This October's anniversary issue will be unloaded from refrigerated vans into the stands and racks. The magazine will be animated! Admitedly it won't be fully animated. It won't have flash-style ads and graphics. In reality, the order of the words will change and there will be images that turn on and off. Currently the images are only black and white (or four shades of grey) and colour is added by a sheet of transparent, tinted plastic. With a huge "Thanks" to Ford (due to an ad for their new Flex SUV) Esquire will be able to sell the anniversary e-paper covers at the standard cover price. The company behind this wonder is eInk.